It being pancake day and all, let us introduce you to the glory that is Vietnamese Pancakes. 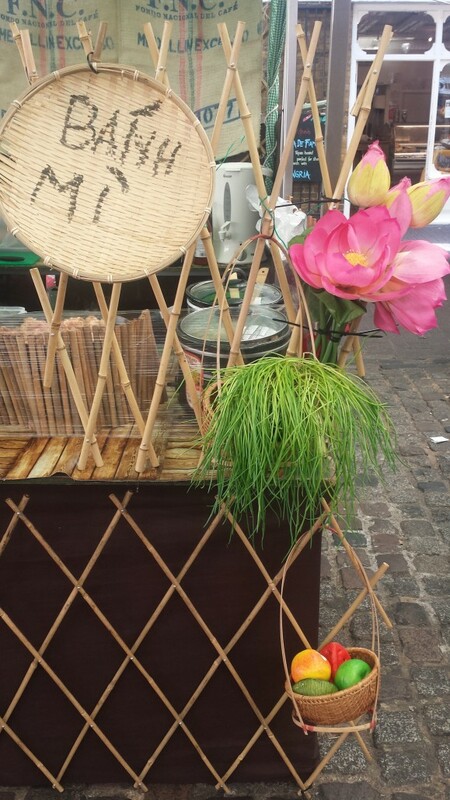 Tran from the Bánh Mì NêN stall at Greenwich Market gave us this recipe for The Greenwich Market Cookbook, and it is not only absolutely delicious but also happens to be gluten-free. It is a great starter or light lunch – a thin, crispy coconut pancake stuffed with chicken, prawns and beansprouts and served with fresh coriander, mint and a salty-sour dipping sauce. It’s a very straightforward batter but you really do need a non-stick frying pan to cook it. The key is to let the pan get really hot, then turn the heat down to low when you start frying the pancake. First make the batter. Mix the rice flour, coconut milk, turmeric and salt together in a big bowl and leave to rest in the fridge for 30 minutes. If it looks too thick, add another 30ml coconut milk or water so you have the consistency of double cream. 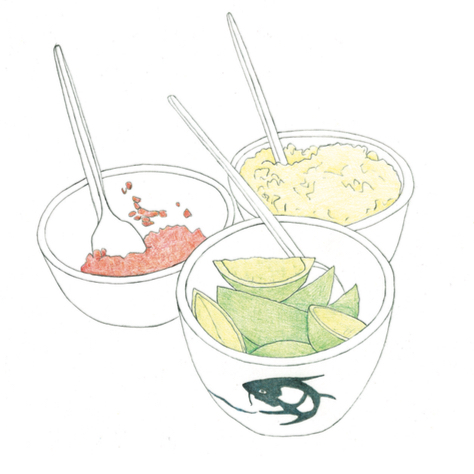 Make the dipping sauce: add the sugar, fish sauce, lime juice, garlic and chillies to 250ml water and stir until the sugar has dissolved. Put the chicken in one bowl and the prawns in another and season both with salt and pepper. When you’re ready to eat, put a teaspoon of olive oil in small non-stick frying pan on a medium-high heat. Once it’s good and hot, add about a quarter of the onion and fry for a minute. Next, add a quarter of the chicken and prawns and fry briefly until the chicken is pale and the prawns have turned pink. Turn the heat down to low. Ladle over enough batter to thinly cover the base of the pan – tip the pan around so it spreads evenly and is as thin as possible. Scatter a handful each of beansprouts, mushrooms and spring onions over one half of the pancake, then cover and leave to cook for 3 minutes. When the batter is cooked through and crispy on the bottom and edges, fold over the side with no filling on it to form a half moon. Cut into four pieces and serve hot on a bed of iceberg lettuce, coriander and mint with the dipping sauce on the side. Repeat with the remaining ingredients to make three more pancakes. Each diner can then roll up bits of pancake with the cool crisp shreds of lettuce and herbs inside, and dip it into the sauce before eating. Buy The Greenwich Market Cookbook here. ©2011-2016 Kitchen Press. All rights reserved. Coming soon…. The Greenwich Market Cookbook! Greenwich Market Cookbook video: Meet the traders!